*Please select and let us know the time of your visit from 09:00 – 11:30 and 13:30 – 16:00. 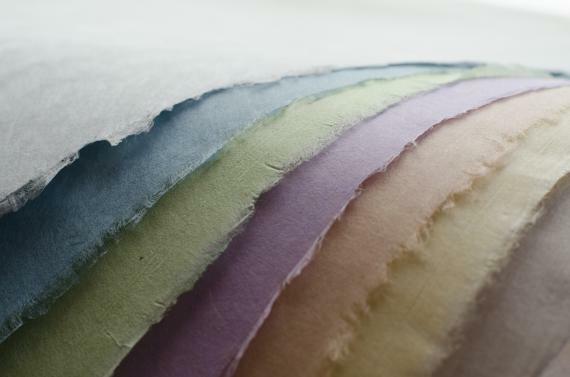 A hands-on experience of making traditional Japanese paper called “Washi.” Why don’t you make your own Washi postcards and design them using natural dyes? Handmade Japanese paper, or Washi, was introduced by Prince Oama (later Emperor Tenmu) to Yoshino more than 1,300 years ago. It is made from paper mulberry, panicled hydrangea, white clay, and soft water drawn from Yoshino mountains. They say it is strong enough to last for 1,000 years. Washi paper has been used mainly for mounting such as scrolls. In these modern days, it is also used for restoring cultural properties in Japan, as well as in the world. 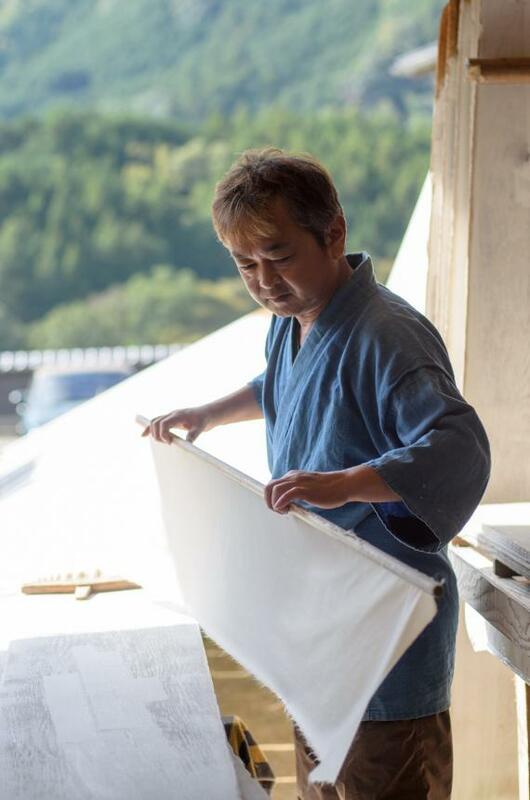 Please enjoy making Washi paper with an instruction of Mr. Masayuki Fukunishi, Traditional Artisan designated by Nara prefecture. 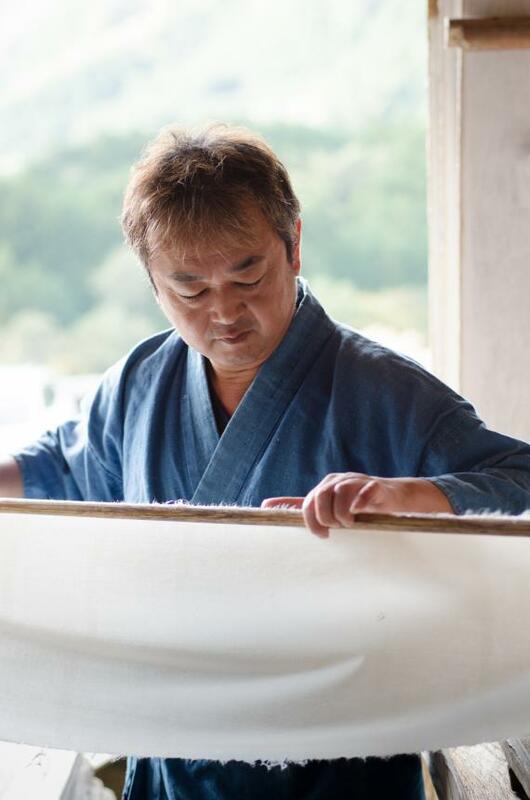 He is also a “Holder of Selected Conservation Techniques” recognized by Japanese government, in the field of making handmade Japanese paper (Udagami) for mounting. 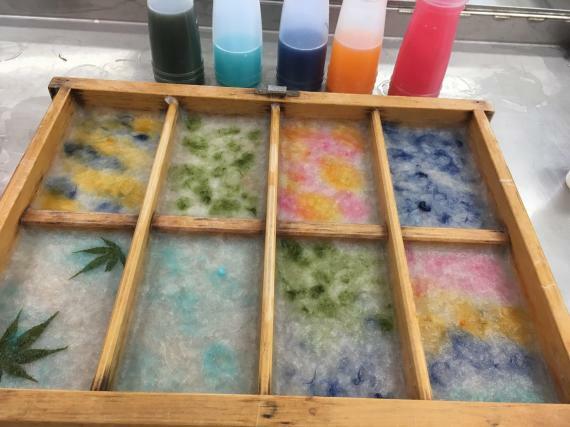 In this program, you will make Washi paper by hand and decorate it with your original designs using natural dyes from plants. It will be your one and only set of eight postcards. Let's try paper making with water,mulberry,paste. I will dye with natural liquid of plant. Original washi with natural dyes. ・We will send your work, after drying it in the sun for a week, to your designated address. A shipping fee is required separately. No need for you to bring or prepare anything. -1 hour and a half from Nara city. -1 hour and a haif from Osaka city. The instructor will explain in easy/simple English. As we prepare the materials beforehand, please promptly inform us of any changes such as the number of persons or cancellations. Cancellations 2 days or 1 day prior to the event require 50% of the participation fee. Cancellations on the day of the event, or no show, require 100% of the participation fee. * The deadline for submission of request is 4 days before the desired date to allow for processing time. Therefore please send request early. Fukunishi Masayuki of the sixth generation of Fukunishi Washihon Honpo is "Holder of Selected Conservation Techniques" recognized by Japansese goverment,in the field of making handmade Japanese paper for mouning. We continue to keep traditional techniques from ancient times until now. For that reason, it is used for restoring culutural properties around the world. Please enjoy making washi paper, and learn Japanese traditional culture.